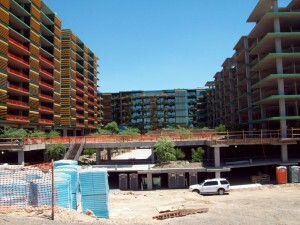 The Optima Sonoran Village Phase II project is progressing nicely. This phase consists of three buildings totaling 20 stories of residential units and 2 stories of below grade parking. The rough in phase of construction is complete in the eleven story building and we are now working to rough in the three story building. Tenants are scheduled to begin moving into the first building by the end of January 2015. A big part of our success is due to the use of prefabricated wall rough. Our prefab division, NEF, manufactures the wall rough offsite and delivers it to the site in a crate that is marked for the specific suite it is to be installed. We are constantly improving our prefab processes and currently our field communicates with prefab via a build sheet. 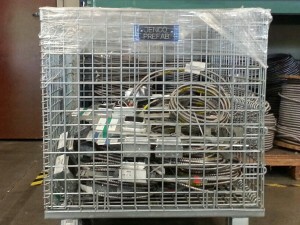 This ensures that the shop product is adapted to the field’s specifications. Utilizing the prefab department has allowed us to increase jobsite productivity and lessen installation times. Also, by having the wall rough assembled in a controlled environment we are able to ensure consistency and superior product quality for our customer. How are you working to increase productivity on your sites? Interested in learning how NEF can help you? Shoot me an email or give me a call.